There is nothing like a hearty stew, even in spring, when the weather has chilled you to the bone. The challenge with some stews is that they are not very colorful after they have simmered for many hours. This Mediterranean, vegetarian stew is topped with a fennel relish as you serve which makes it an exception. As you can see by the photo, it has a colorful visual appeal. My daughter loves artichokes which is why I picked this particular recipe on our Mediterranean Diet. 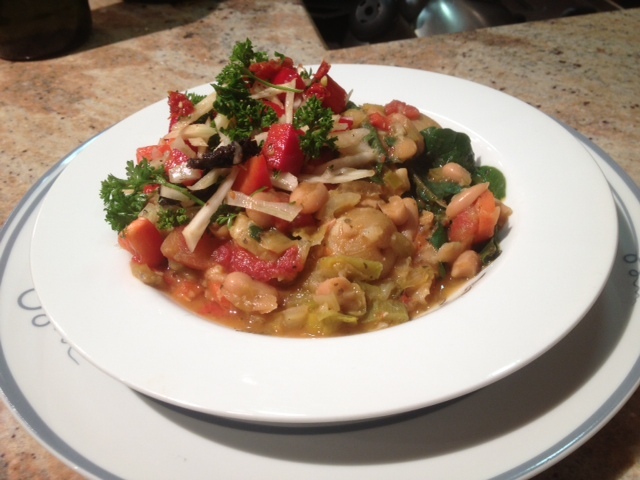 The artichokes along with Swiss Chard and the fennel you add to the stew give an original flare to this crockpot stew. The combination made for a flavorful meal. One serving is 290 calories. To complete the menu I added a slice of store bought artisan Olive Bread (116/cal) for a total calorie count of 406. It hit the spot with everyone. A definite repeat.